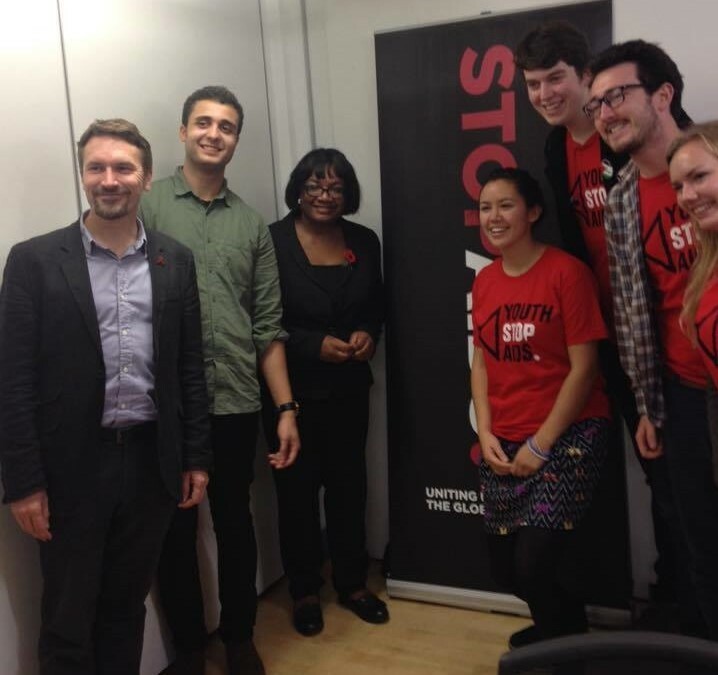 At the STOPAIDS AGM in late October I was elected onto their Board of trustees as a representative of the Youth Stop AIDS movement. It’s my responsibility to bring the Youth Stop AIDS perspective to STOPAIDS. I’m really interested in hearing from you and the other people young people in your networks – so that we can shape the future of STOPAIDS in our collective vision. If you have any ideas for the future direction of STOPAIDS or want anything raised to the board – please do drop me a message (james.cole1994@yahoo.co.uk)! Hi my name is James Cole – I’m a fourth year Politics student at the University of Sussex, and like millions of other young people around the world, I am passionate about issues surrounding HIV. I’m currently President of the Brighton branch of Youth Stop AIDS. 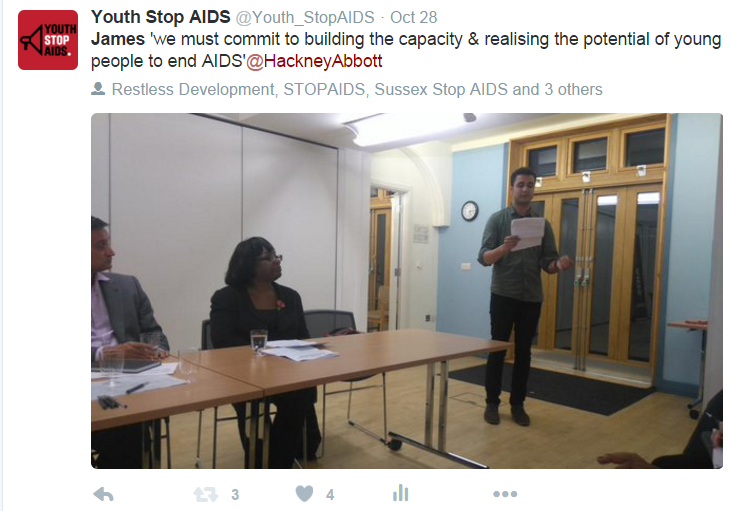 From doing such things as working with our great MP Caroline Lucas – to being part of the team that unveiled the world’s largest red ribbon in Brighton for World AIDS Day – we are actively lobbying, campaigning and hosting awareness raising events – ultimately fighting for a world without AIDS in 2030. We’ve also spoken out and campaigned against TTIP and as a result we have helped to draw the public’s attention and mobilise resistance to this dangerous EU-US trade agreement that would be detrimental to our access to affordable medicines. I’m proud to be part of Youth Stop AIDS and join this powerful movement fighting to stop the shocking injustices that remain in access to medicine. But as a group of young people – we are not alone. We are ultimately part of a wider global movement of young people taking the lead fighting for social justice. Despite this – too often the views of young people are overlooked by decision-makers on local, national and international levels. Even in this country 16 and 17 year olds still don’t have the ability to vote in elections – despite having both a clear stake and an interest in our society’s future. The systematic marginalisation of young people around the world urgently needs to be addressed – especially in relation to issues surrounding HIV – given that AIDS remains the leading cause of death of adolescences in Sub-Saran Africa – and young people remain disproportionately affected by new HIV infections. For example In South Africa, around 60% of adults who contracted HIV become infected before they turn twenty-five – making young people particularly at risk. Indeed the young HIV activists in South Africa known as the ‘urban warriors’ have been effective in advocating for an improved response to the HIV/AIDS epidemic but largely decision makers aren’t responsive to the views of young people. I welcome the Department for International Development decision to appoint 2 youth delegates to take part in vital international conferences on global poverty – but I believe that the government should be doing more to invest & empower young people to lead change in their communities – which would help strengthen the global HIV response. This is now of particular importance as we entering the period of ‘Peak Youth’ where over half the world’s population is under 30. The UK has recently signed up to the new Sustainable Development Goals. Target 3.3 includes ending AIDS by 2030. If international governments are committed to ending AIDS by 2030 – we must build the capacity and recognise the potential of young people if we are to seriously commit to ending AIDS!